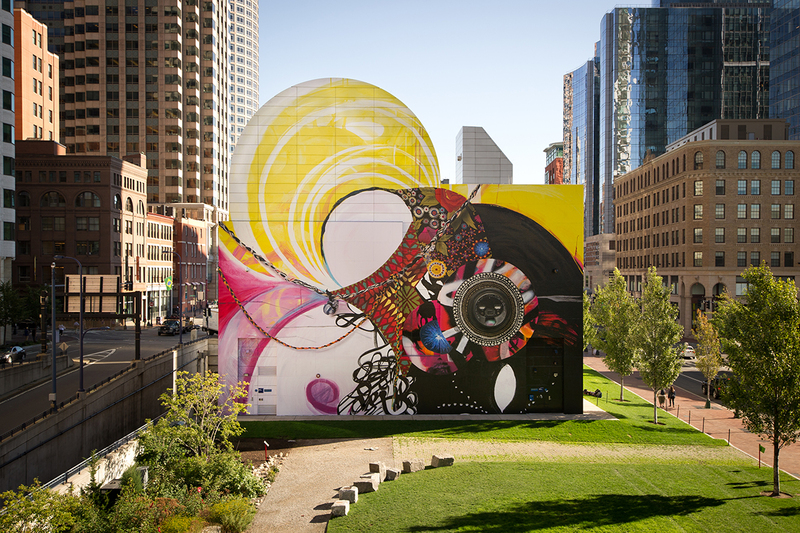 In what has become an annual fall tradition, yet another acclaimed artist will soon paint a new mural on the Greenway Wall at Dewey Square. The Rose Kennedy Greenway Conservancy announced today that it has commissioned internationally renowned conceptual artist Lawrence Weiner to paint its fourth temporary mural, this time in partnership with the MIT List Visual Arts Center. Weiner, whose career spans more than 50 years, has been awarded fellowships from the National Endowment for the Arts and the Guggenheim. He’s known for his typographic works, such as his 2008 Dead Center installation at MIT, consisting of three phrases of text incised into three geometric shapes of colored granite and imbedded into a concrete path in the courtyard of the Ashdown House. Weiner’s mural at Dewey Square will be titled “A Translation from One Language to Another.” Its specific design is being kept under wraps for now, but, like Weiner’s installation at MIT, it will feature text. The List Center is the third institution to partner with the Greenway on its mural commissions. The first two—The Giant of Boston by Os Gemeos and Remanence: Salt and Light (Part II) by Matthew Ritchie—were created in partnership with the Institute of Contemporary Art. The mural currently on display, Seven Moon Junction by Shinique Smith, was created in collaboration with the Museum of Fine Arts. Weiner’s mural is scheduled to be installed September 14-20. An opening celebration will follow on September 24, and the artist will participate as a panelist in the List Center’s Max Wasserman Forum on Contemporary Art, which will focus on public art, in November.